The décor of an event is often defined by the centerpiece as it is the object that grabs the most eyes. 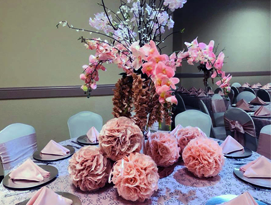 At Azul Reception Hall we offer you beautiful centerpieces that add grace to the event. Irrespective of your budget we will create wonderful centerpieces that blend with the overall theme of the event. From purely floral arrangements to contemporary designs with lights and candles, we offer you a lot of options to choose from. If you have a crazy idea in your mind share it with us and we will translate your vision into reality.